Tuberculosis is one of the most common infectious diseases on the planet: about a third of the current global population has had TB. It's also one of the most deadly. Left untreated, it kills about half of all those it infects. Now it seems the disease could date back to humanity's origins in Africa. There's documentary evidence to suggest tuberculosis was common in multiple times and places at the dawn of civilization thousands of years ago. It most likely killed Tutankhamun's parents Akhenaten and Nefertiti, and bison remains dated to about 17,000 years ago provided the very earliest indication of TB's existence. But now researchers at the Swiss Tropical and Public Health Institute have pushed the origin of TB back another 50,000 years, to the very beginnings of anatomically modern humans' migrations out of Africa. Researcher Sebastien Gagneux and his team sequenced the genomes of 259 tuberculosis strains collected from all over the world. 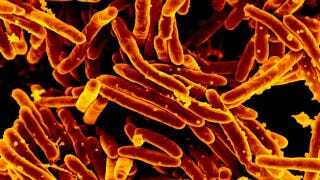 With that data, the researchers were able to reconstruct a sort of family tree of TB's genetic evolution. Remarkably, the phylogenetic trees for tuberculosis and Homo sapiens reveal a close match, indicating that the bacteria likely evolved alongside our own human ancestors. The bacteria likely first emerged in the same region of Africa where modern humans did, and its descendant strains moved with humans as various groups left Africa and gradually spread to all corners of the globe. That said, the disease was perhaps not always the killer that it became in the last ten thousand or so years. It's unlikely that very many migrating groups would have survived multiple generations if they were moving with a bacteria that routinely kills half of all those it infects. Gagneux suggests that the first 60,000 years of the human-TB relationship was, if not exactly benign, then relatively mild. It's only in the Neolithic period, about 10,000 to 12,000 years ago, that things began to change. Human populations boomed, and the first proto-villages and towns begin to form. At that point, human population numbers become concentrated enough for more deadly tuberculosis strains to spread, because they depend on human-to-human transmission. That's the point at which it really became a serious hazard to public health. Nature Genetics via the Swiss TPH. Image of tuberculosis bacteria by NIAID on Flickr.